Lawmakers in France, the birthplace of Rousseau and the idea of modern political liberty, have approved one of the most draconian laws ever seen in the fight against digital piracy of music, movies and software. On Tuesday, the French National Assembly approved a bill, known as HADOPI 2, which would allow a French court to cut off a citizen's internet access after the third instance of copyright infringement. The judge could also impose a fine of up to EU300,000 ($415,000) or two years in a French prison. "Freedom is not free license, liberalism isn't the jungle," French Culture Minister Frédéric Mitterrand declared Tuesday. Mitterrand, who shepherded the new version of the law through parliament, said the measure would prevent "pillage" of works of art by "demagogues" who argue that everything on the web should be free, according to Reuters. The winding development of France's so-called "three strikes" law has been closely watched around the world as an important test of state power to crackdown on digital piracy. An earlier version of the law had been approved by the French Parliament in April but was struck down as unconstitutional before it could be enacted. Undeterred, the government of President Nicholas Sarkozy returned to parliament with a new bill, which it hopes will not be similarly rejected by the Constitutional Council. Individuals convicted of so-called "negligence" for allowing a third party to "steal" music or movies using their internet connection -- by using an unsecured Wi-Fi network, say -- could face a EU1,500 penalty and a month-long suspension of their web access, according to the AFP. "The penalties will probably be quite rare, for I believe in the effectiveness of this deterrent," Mitterrand told the AFP. The "three-strikes" law has been a major initiative of President Sarkozy and his model-singer wife, Carla Bruni. Opponents of the law -- mainly on the French political left -- immediately announced a constitutional challenge to the controversial new measure. "HADOPI 2 is still as dangerous as the first one, infringing on freedom of expression and communication, and still bound to fail," Jérémie Zimmermann, co-founder of the citizen advocacy group La Quadrature du Net, said in a statement. "The repressive logic underlying the 'three strikes' is fundamentally incompatible with an inevitable evolution towards increasing the revenues generated by cultural works on the internet, while accompany the right for people to freely exchange cultural works for non-commercial purposes," Zimmermann said. "Let's hope that the Constitutional Council will once again protect French citizen's fundamental rights." The law, which passed the French parliament 258 to 131, was backed by the music and film industries, which have seen dwindling CD and DVD sales amid the meteoric rise of peer-to-peer file-sharing. The measure was opposed by consumer groups. 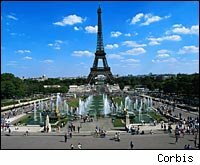 The same legislation passed the French Senate on Monday. The law would create a French bureaucracy, the High Authority for the Distribution of Works and the Protection of Rights on the Internet (hence HADOPI), which would handle infringement complaints and issue warnings to those thought to be digital pirates.